Field experiments were conducted over eleven site-years where five K rates (0, 93, 187, 280, and 373 kg K ha−1) as KC1 or K2SO4 were band-applied at planting to potato (Solanum tuberosum L. ). Significant yield increases up to 332 kg K ha−1 were observed in five of eleven site-years when soil test K ranged from 75 to 110 mg kg1. The increase in tuber yield was associated with an increase of tuber size (170 to 370 g) and above in the US#1A category. Lack of yield response at the other site-years may be due to the high soil test K (125 to 180 mg kg−1). 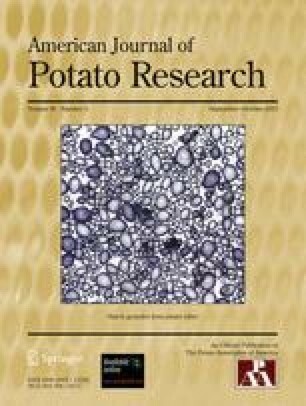 Statistically significant differences in total tuber yield were not evident between the two sources of K fertilizer studied; however, there was a tendency for a significant rate x source interaction (p > 0.15) in five site-years where K2SO4 increased tuber yield more than KC1 at rates up to 280 kg K ha−1. Above this rate, tuber yield decreased for K2SO4 but remained stable for KC1. Based on the tuber yield data and initial soil test K from the controls of each site-year, data from this study suggest that 104 mg K kg−1 is a critical pre-plant soil test level. A reduction in specific gravity with increasing applied K was evident in most of the site-years of this study, although decreases were generally not as marked when K2SO4 was used. A significant decrease in hollow heart with increasing rate of K fertilization was observed in four of eleven site-years; however, statistically significant yield responses to added K were found at only one of these sites. The incidence ofRhizoctonia solani was generally not affected by K rate; however, there was a tendency in some site-years for a higher disease incidence when KC1 was used instead of K2SO4 Potassium rate slightly decreased stem numbers per seed piece, averaging 3.7, 3.6, 3.5, 3.4, and 3.3 across all experiments, for the 0, 93, 187, 280, and 373 kg K ha−1 rates, respectively.